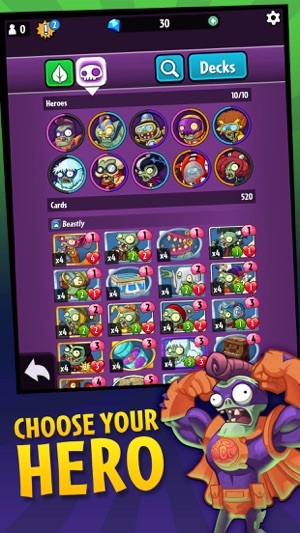 Discover 20 unique plant and zombie heroes, unlock their lawn-inspiring super powers, and choose your favorites based on their signature styles and abilities. Will you pick plants and deploy the masked, sharp-shooting avenger Green Shadow? Or will you choose a zombie hero, like the superbly superficial Super Brainz? Each hero’s unique selection of super powers helps define your team’s winning strategy. Every hero needs a crew. 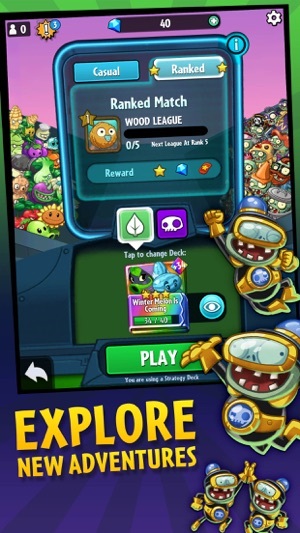 Build yours and diversify your skills by collecting or crafting hundreds of cards – from the PvZ characters you know and love, to daring original plants and zombies. Devise distinct strategies when you select cards compatible with your hero, and experiment with devastating combos. Use the Deck Builder to quickly construct winning decks, try out strategies, and upgrade your decks as you collect and craft characters. Test your deck when you take on other players or challenge your friends in exciting real-time matches. Practice tactics in casual multiplayer battles or enter competitive ranked play to compete with the best players in the world. Earn rewards for defeating the bite-iest adversaries, and build your bank when you complete Quests from Crazy Dave and Dr. Zomboss. Journey through the universe of PvZ Heroes as each action-packed skirmish takes you further along an ever-blooming map. Take on brain-thirsty or botanical foes along the way and hone your skills – each side has a different path to follow. Defeat challenging bosses to unlock fresh characters and new rewards. Even take your team with you when you switch between mobile devices – just sign into Facebook, Game Center, or Google Play to save your collection. 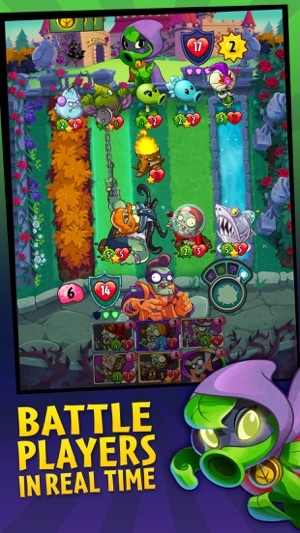 PopCap’s done it again. By taking their amazing lawn-battling recipe and changing the ingredients, they’ve created a game that’s undeniably unique. This time, we’re building decks, collecting heroes, and fighting friends in head-to-head battles. As usual, the humor is plentiful and the animation is wonderful—but Heroes’ smart gameplay and clever challenges are what we just can’t get enough of. I’m typing with Siri because it would take too long to type this out on my own. This is such an amazing game and I love it and I played almost every day. No wait I do play it every day. The daily challenges are so fun and motivating to keep going, the event cards add some diversity to the game and an overall motive to keep earning the event tickets. At the same time though, imagine how much more fun it would be if you could be the one deciding what the special rules were in the challenges? 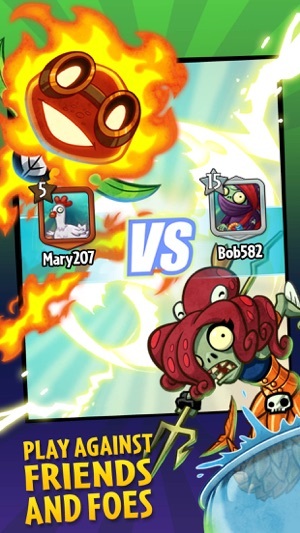 What if you could change the normal rules of a match to be something more like a daily challenge more specifically a twisted rules daily challenge. With the ability to decide who you start with who you start with on the field and how much Health you have and how much sun and or brains you have. Not to mention the idea of being able to do whatever the creators could do when they make the daily challenges. And you could do this with your friends or with computers and you could do it as many times as you want and it would be like completing a normal off-line match. This probably isn’t a very good idea but it would make my day and or play experience so much more enjoyable if you would even consider doing this think of it as a type of custom match that you don’t get the same rewards out of as a normal multiplayer battle thank you for your time and keep doing what you’re doing! CHANGE. THE. BONUS. PLANT. HEROS. I swear to God, since Christmas the bonus plant hero’s have only been either Spudow or Captain Combustible. Often times it’s been the same one two weeks in a row. I’m completely fed up with it and am about to permanently quit this game. I used to occasionally drop some money on this, but since the repetition started I’ve stopped because I don’t want to drop money to possibly not be able to use the cards I get. The main thing that keeps me invested in the game is earning the event cards, so I can eventually play them. Used to be that you’d get to play them plenty the following week when the bonus hero would be a deck that used those cards. Now that’s both not happening, I don’t feel like playing the same hero for the millionth time in a row in the past three months, and I’m quickly losing interest without the feeling of something to progress towards. I tried to report this in game multiple times to someone who might try to suggest doing something about this and never received anything other than “thank you for your feed back” or what was essentially “not my department”. Now you have this feedback permanently negatively impacting your rating for everyone to see. 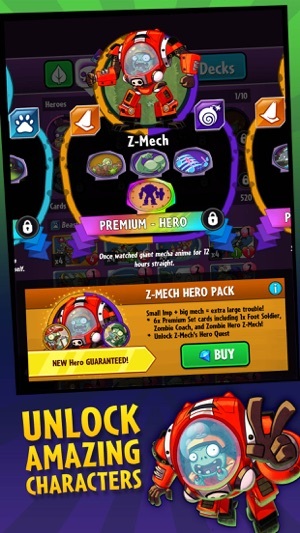 If you don’t want to also permanently lose the chance of getting money from me again change your system back to not allowing repeat hero or hero types for the plant heros. At the very least, work some solar or smarty heros in there every couple of weeks. This has been ridiculous.